Do you remember that movie Sliding Doors, where Gwyneth Paltrow either makes her train or misses it, and then the movie splits into two different universes depending on that one moment? I loved that movie as a teenager — I had a weird thing for John Hannah, who was also in The Mummy, another one of my teen obsessions — and this book similarly enchanted me. 29 year old Hannah Martin has returned to L.A. after ending an affair in New York with a man who turned out to be married. She’s spent most of her adult life aimlessly bouncing around, looking for “home” — a concept she feels robbed of after her parents moved to London with her sister (to help her pursue a ballet career) when Hannah was 16. At that time, Hannah moved in with her best friend Gabby, and 13 years later, she’s back in Gabby’s guest room. One her first real evening back in L.A., she meets up with an old flame at a bar. 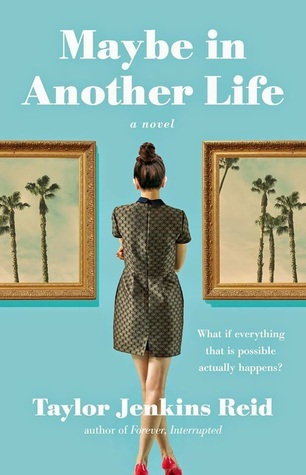 Her decision whether or not to go home with him splits the narrative into two parallels — one where she rekindles the flame but finds out she’s pregnant with her married ex’s baby, and another where she turns him down, then gets hit by a car and ends up in the hospital (…yeah). The idea for the book is cute, and the author handles it well — some major events (the discovery of her pregnancy, and some others I won’t spoil for you) coincide in both plotlines. The chapters are fairly short, so you don’t have to worry about getting lost in one reality then feeling confused by switching to another. What I liked most of all was the friendship between Hannah and Gabby. Reid did a wonderful job of capturing that magic that exists between two women who have been best friends for forever — the strength they get from each other, and the bond that never fades. The romances that Hannah encounters in the two worlds are well-done, but it was that love between her and Gabby that really made the book for me. Share the post "A literary Sliding Doors"
Jane the Virgin did a Sliding Doors homage this week! I love that show. Have you seen Spartacus? John Hannah is fantastic in it. I also love that show. It’s criminally underrated. If I hadn’t already loved Jane the Virgin, the Sliding Doors reference would have clinched it. Yay glad to hear this is good! I got this on Audible as one of their daily deals specifically because of Sliding Doors, that movie is fabulous. This sounds like something I’d enjoy reading. Added to the TBR pile!